Based on these diverse classification methods, some drugs may be grouped together under one system but not another. In other cases, a drug may have multiple uses or actions (such as the drug finasteride, which is used to treat an enlarged prostate and regrow hair) and may be included in multiple drug classes within a single classification system. This doesn't even take into account the drugs that are used off-label for reasons other than what they were approved. A prime example is levothyroxine which is approved to treat hypothyroidism (low thyroid function) but is often used off-label to treat depression. Because of the diverse methods of classification, consumers can often be confused when their doctor calls a drug an ACE inhibitor, their pharmacist calls it an antihypertensive, and they read online that it is a vasoconstrictor. Ultimately, all of these terms can be used to describe the same drug used for the same purpose. As newer and more advanced drugs are being introduced into the market each year—including next-generation targeted therapies, gene therapies, and personalized medicines—the classification of drugs will likely become even more diverse and distinct, reflecting our ever-expanding knowledge about human biochemistry as a whole. The aim of drug classification is to ensure that you use a drug safely to achieve the utmost benefit. Ultimately, every time you take a drug, your body chemistry is altered. While this effect is meant to be therapeutic, it can also cause side effects that may be harmful. Moreover, if you take multiple drugs, your body chemistry may be changed in such a way that a drug is far less effective or the side effects are far more severe. By noting the classification of a drug, you and your doctor can have a better understanding of what to expect when you take it, what the risks are, and which drugs you can switch to if needed. This designation also helps identify drug-drug interactions and the potential for drug resistance and ensures the appropriate staging of treatment. The effectiveness of a drug can often be reduced if the action of one drug diminishes the action of another. Since drugs are commonly classified by their mode and mechanism of action, any interaction affecting one drug will usually affect drugs of the same class, either by interfering with their absorption or the way in which the body metabolizes the drug. For example, antacids invariably work by blocking stomach acid but, by doing so, deplete the stomach of the acids needed to break down and absorb a class of HIV drug known as protease inhibitors. If the medications are taken together, the HIV drug will be less able to control the viral infection. Similarly, many classes of drug are cleared from the body by a liver enzyme called CYP3A4. If you take two drugs that are each metabolized by the enzyme, the drugs may not be cleared as effectively and begin to build up, leading to toxicity. By classifying a drug by its CYP3A4 action, doctors are better able to avoid this interaction. The same applies to drugs like methotrexate and Advil (ibuprofen) that are metabolized by the kidneys. Their concurrent use may not only lead to toxicity but kidney failure. Other classes of the drug need to be used with caution when combined with those that affect the same organ system. For example, non-steroidal anti-inflammatory drugs (NSAIDs) like Motrin or aspirin are often avoided when taking anticoagulants (blood thinners) like warfarin, as the former can increase the risk of bleeding while the latter inhibits the clotting of blood. It is for this same reason that two NSAIDs are not combined. In some cases, doubling the class of drug only serves to double the risk or severity of the side effects. Medications used to treat chronic infections do so in a specific way. If used incorrectly or for a long period of time, a drug may lose its potency as the infection becomes resistant to its effects. If this occurs, other drugs of the same class may also fail or not work as well. Antibiotics (of which there are seven major classes) and HIV drugs (of which there are six classes) are two such examples. Depending on the class, some may have a greater potential for resistance than others. To better overcome resistance, multiple classes are commonly prescribed to achieve optimal control of the bacterial or viral infection. Drugs are often staged so that you are first exposed to over-the-counter drugs with the fewest side effects and then moved to prescription options that have more serious side effects. 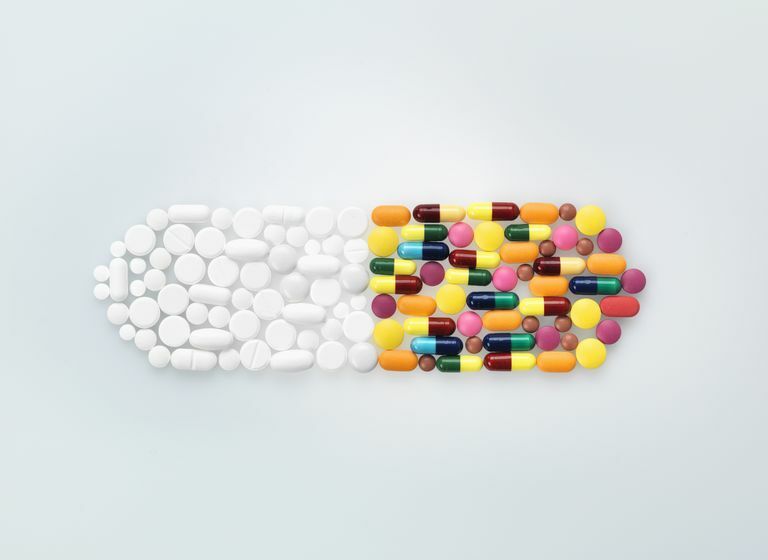 The drugs are often staged by class under a prescribed guideline, with "preferred" classes used for first-line therapies and "alternate" classes used for subsequent therapies. For example, when treating severe pain, doctors will generally use over-the-counter NSAIDs first and prescription NSAIDs second before moving onto highly addictive, Schedule II opioid drugs like Oxycontin (oxycodone) and Vicodin (hydrocodone). Drug staging is also vital to treating chronic diseases like diabetes, hypertension, chronic obstructive pulmonary disease (COPD), and autoimmune disorders like rheumatoid arthritis. In cases like these, the class of drug typically directs the appropriate staging of treatment. Level One describes the organ system the drug treats. Level Two describes the drug's therapeutic effect. Level Three describes the mechanism/mode of action. Level Four describes the general chemical properties of the drug. Level Five describes the chemical components that make up the drug (essentially the chemical name of the drug, such as finasteride or ibuprofen). For each level, either a letter or numbers are assigned. While not useful for the consumer, the ATC system is able to classify the active ingredient of a drug under a strict hierarchy so that it is appropriately used and not mistaken for another drug. In the United States, a non-profit, non-governmental organization called the United States Pharmacopeia (USP) was established in 1820 to ensure that prescription and over-the-counter drugs approved for use in the United States meet quality standards in order to be placed on the National Formulary issued by the U.S. Food and Drug Administration (FDA). Among its many functions, the USP was tasked by the U.S. Congress to classify drugs so that Medicare Prescription Drug Benefit providers can include them in their annual formularies. Worldwide, there are 22 other countries that maintain national pharmacopeias, as well as a European Union Pharmacopeia for EU countries that don't maintain their own pharmacopeia. Other countries will typically rely on the International Pharmacopeia maintained by the WHO. For its part, the USP classifies drugs in a far broader way than the ACT system, categorizing a drug, firstly, on its therapeutic use; secondly, on its mechanism/mode of action; and, thirdly, on its formulary classification. Even with this streamlined system, there are still dozens of different drug classes and thousands of different sub-classes and sub-categories. U.S. Food and Drug Administration. USP Therapeutic Categories Model Guidelines. Silver Spring, Maryland; updated March 28, 2018. World Health Organization (WHO). Review of World Pharmacopeias. International Meeting of World Pharmacopoeias; Geneva, Switzerland; February 29-March 2, 2012.
WHO Collaborating Centre for Drug Statistics Methodology. ATC/DDD Index 2018. Geneva, Switzerland; updated December 20, 2017. What Do Different Types of Physicians Do? Are You Saving Money by Comparing Drug Prices Online? Can You Save Money Buying Drugs From Canadian Pharmacies?